A basketball game set in the Mushroom Kingdom, developed by Square Enix. 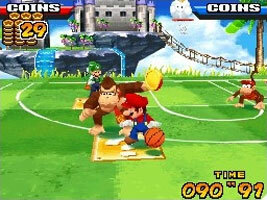 Mario and friends hit the courts and use their special moves to perform spectacular dunks. The cast is joined by characters from Square's Final Fantasy series. Choose three characters for your team. Score more points than the opposite team before time runs out by throwing the ball through the opponent's hoop. Move the characters around on the touch screen and collect items to use against the other players. Power-up your character's special moves by tapping out a special sequence on the touch screen. Mario Hoops was developed by Square Enix, and they included several playable characters and stages from their popular Final Fantasy RPG series in the game. Final Fantasy bombs also appear on Bowser's Court and Rainbow Road as hazards.